NETWORK FINALS: DATELINE and the rerun of AMERICA’S GOT TALENT rose 0.1 in final numbers, while 20/20 fell the same. CABLE HIGHLIGHTS: A&E’s LIVE PD led Friday cable with a 0.14 jump to 0.56. HBO’s REAL TIME WITH BILL MAHER dropped 0.05 from last week’s controversy-fueled episode to 0.41. Adult Swim’s 2 15-minute early morning segments of WILLIAMS STREAM were at 0.35/0.31, identical to last week. MSNBC’s RACHEL MADDOW SHOW easily topped cable news at 0.35/2.7M, compared to CNN’s SITUATION ROOM at 0.21/1.1M, and Fox News’s FOX & FRIENDS at 0.19/2M. On HGTV, MY LOTTERY DREAM HOUSE gained 0.07 to 0.33, and both HOUSE HUNTERS and HOUSE HUNTERS INTL were at 0.31, respectively up 0.05 and 0.04. VH1’s RUPAUL’S DRAG RACE shed 0.02 to 0.30. 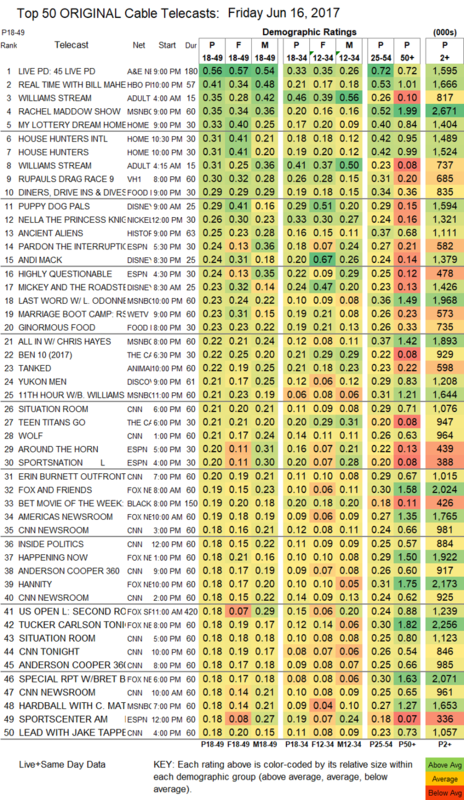 On Food Network, DINERS, DRIVE-INS & DIVES climbed 0.06 to 0.29, and GINORMOUS FOOD was steady at 0.23. Disney Channel’s strongest show was at 8AM, with PUPPY DOG PALS at 0.29, while the primetime ANDI MACK was down 0.02 to 0.24. Nickelodeon’s noon NELLA THE PRINCESS KNIGHT ticked down to 0.26. History’s ANCIENT ALIENS fell 0.04 to 0.25. We’s MARRIAGE BOOT CAMP grew by 0.08 to 0.23. Discovery’s YUKON MEN ticked up to 0.21. 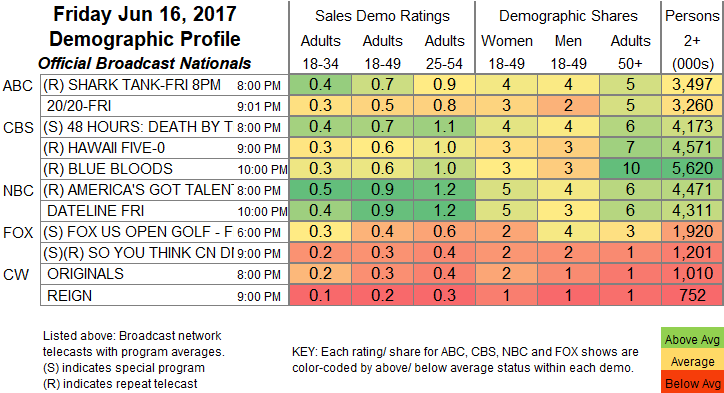 On Syfy, DARK MATTER gained 0.02 to 0.17, and WYNONNA EARP was up 0.05 to 0.14.